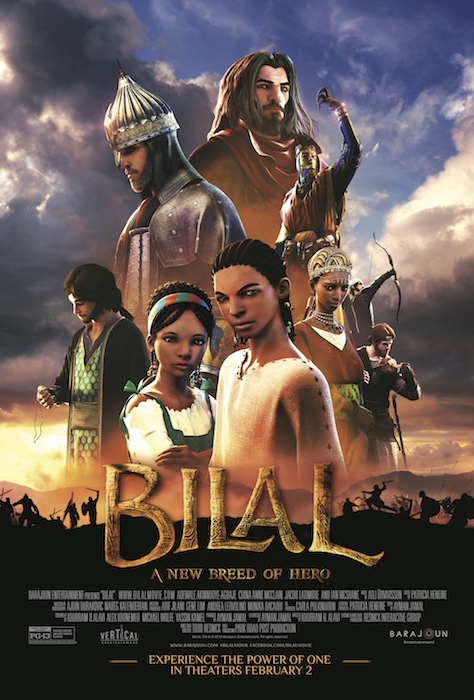 The story "Bilal: A New Breed Of Hero" is inspired by the true events of the African slave Bilal ibn Rabah. This movie will teach many lessons to children and adults. It is full of adventure and shows us the importance of having the courage to step up within our communities as teachers and leaders and seek greater understanding and knowledge of the world around us. We must be open and willing to accept new ways of thinking if we hope to change the world for the better. This animated story shows the struggles Bilal goes through during the times of ignorance in Arabia when slavery was happening. During Bilal's time in Arabia, there was a movement happening where Islam was being accepted by people. When everyone who accepts Islam became brothers they were targeted by the idol worshippers in Arabia who wanted to hurt those who accepted monotheism. Bilal ibn Rabah stood up for what he believed, and became free from slavery. He was the first person to say the call to prayers. The story of Bilal is similar to that of Martin Luther King Jr., who believed in the unity of mankind and equality of all people. Bilal used his gifted voice to speak out against injustices and took a stand for freedom despite the risks to his own life. 1,400 years ago, Bilal, a seven-year-old boy, with a dream of becoming a great warrior, is abducted into slavery with his sister and taken to a land far away from his home and thrown into a world where corruption and injustice rule all. Throughout his life he undergoes many hardships, through which he discovers an inner strength he did not realize he possessed. Through these experiences, Bilal comes to realize that if he is brave enough to raise his voice and choose his own path, this is when everything becomes possible. It is through his courage, that he frees himself and ultimately his community; it is through the power of his voice and faith that his lifelong dream of freedom comes true. Bilal grows into a man who inspires the world. Bilal, Martin Luther King Jr., and many others seeking equality throughout history inspire us all to find our inner power and take a stand for what we believe is right. One courageous person can make a difference in this world. This story is a reminder that if each and every person embraces their own inner power it can be manifested as a force for good. Very cool! My kids will love it! This movie sounds like a great teaching tool on equality. It's very important for children to learn that through courage, strength, and determination they can overcome adversity. Looks like a very good and inspirational movie! Sounds like the perfect movie to see during Black History Month. Thanks for sharing this. I had not heard about this movie prior to reading your review. I love that this is a learning opportunity about something real instead of just being make belief like so many other movies. My family is very excited to see this film. I think this would be a lot of fun.